Serving the Community: YWCA Passage Point is an innovative, supportive residential community for individuals discharged from the corrections system seeking to reunite with their children and reintegrate into the community. 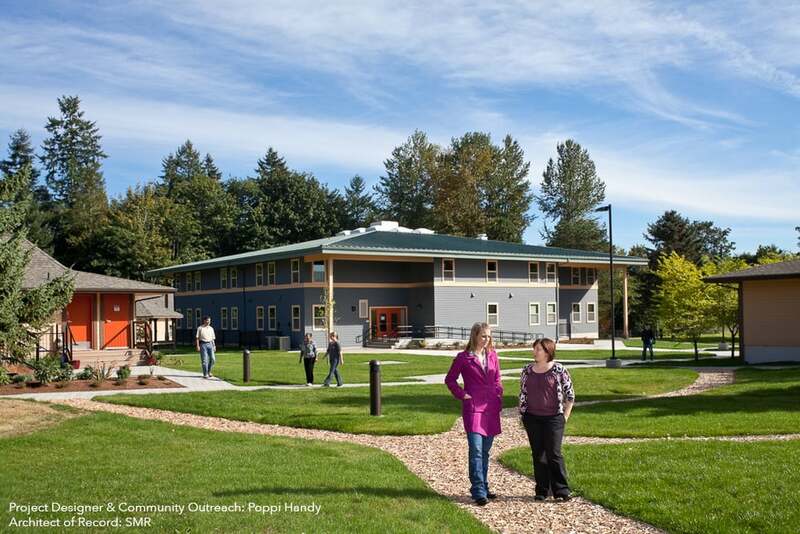 Finding Solutions: The development – a unique partnership with the YWCA and King County – involved the creative adaptive reuse of six 1960s-era wood-framed buildings that once housed King County’s Cedar Hills Alcohol Treatment Center. This seven-acre site is highly complex with adjacencies to Cedar Hill landfill and multiple on-site wetlands. Solutions involved methane gas monitoring and wetland coordination and permitting with army core of engineers and King County. Extensive wetland mitigation and relocation was integral to the success of the project. Unique Features: Passage Point provides 46 apartment units, administrative office space, classrooms, a computer lab, indoor and outdoor children’s play areas and other supportive services that assist residents in gaining self-sufficiency. Role: Poppi served as Associate Principal and Project Manager while at SMR during the design phases.